A new year gives rise to fresh opportunities to engage customers. When done right, a social media contest can be a great vehicle for driving engagement and rewarding brand loyalty. It’s also an easy way to get new Likes, email subscribers and sales leads for your business. Facebook’s user base and low barrier to entry makes it a popular platform to hold contests. But there’s more to a successful contest than just collecting Likes. There are strict rules in place, and coming up with Facebook contest ideas can prove challenging. Before you start handing out prizes, familiarize yourself with Facebook’s contest rules. Then read on for inspiration from some of our favorite branded examples. We recommend reading through the Promotions section of Facebook Page Terms for detailed legal guidelines for businesses. To help you, we’ve broken down the important parts of the section in an earlier article: Read This Before Launching a Facebook Contest. Promotions can be held on Pages or within apps on Facebook. Personal Timelines and friend connections can’t be used. This means that “Share on your Timeline to enter” or “Share on your friend’s Timeline for additional entries” aren’t permitted. You can collect entries by having members message the Page, post on the Page or comment on or Like a Page post. You can’t, however, encourage people to tag themselves or friends in a post in exchange for entry. You can’t require anyone to Like your Page in order to enter your contest. You’ll also be responsible for providing official rules of the contest, offer terms and eligibility requirements and compliance with any applicable regulatory approvals. A successful Facebook contest captivates audiences and returns leads that are actually interested in your business. While giving away the season’s hottest gadget will garner a lot of attention for your contest, it won’t bring in quality leads. Your contest needs to be enticing, but it should also get people thinking about your product or service. Here are a few compelling Facebook contest ideas that you can use to create engaging and effective promotions on your Page. Don’t ask just any question–take a product or service you offer and ask people how they would use it. The winner then receives the product or service. It’s a very simple concept, but one that pays off in a couple of different ways. For instance, it encourages people to engage with your product or service and to think about it in an unusual or interesting way. Even if someone doesn’t win, they’ll be more likely to make a purchase since your question got them thinking about reasons to use your product or service. It also creates a lot of social recommendations for your product or service. According to a 2014 study, 74% of consumers identified word-of-mouth as a key influencer in their purchasing decision. The testimonials that result from your contest carry a lot of social influence. What product/service/feature would you like to see next? Tell us about your latest experience with our brand/product/service. You can later repurpose the entries as part of your content strategy, creating new opportunities for engagement and rewarding clever and creative contestants. This particular Facebook contest idea works best if your product or service is more mainstream. If you offer something that’s very niche, it might be difficult to think of a use care and fewer people will enter. This is probably the easiest of the Facebook contest ideas as it requires the least amount of work on both your end as well as your followers. But you have to be careful not to violate Facebook’s terms by asking people to Like your Page. For this contest to work, you’ll need to focus on a specific Page Post. For example, let’s say that your Page just received its 10,000th Like and you mark the occasion by publishing a Milestone post. You could tie in a giveaway to celebrate by telling fans to Like your Milestone post. All they have to do is click “Like” for a chance to win. Or, if you’re looking to get more engagement out of this, you could tell fans to comment to win. Just be clear with your instructions and let participants know what to expect. To avoid any confusion, make sure you let people know how winners will be chosen and how and when they’ll be notified. A great way to engage fans in conversation is to test their knowledge on your product. You can also ask little-known trivia questions about your company to engage users. Ask fans what year your business got started or what your top-selling product is. In a separate update share the answer. This encourages them to come back and engage more with your Page. Testing customer knowledge through social media contests can benefit your brand in a number of ways. For example, this is an opportunity to showcase a lesser-known feature and educate customers. The contest strategy also lets you see which features or facets of your service your customers are struggling with. This information can be used in developing updates or creating more helpful content, like tutorials. It can also help you to identify potential brand ambassadors or industry influencers. Coca-Cola, for instance, has a lot of fun with this marketing tactic. Although the brand doesn’t usually offer a prize in exchange for comments, its trivia questions and clever videos pique the curiosity of followers and bring out their competitive spirit. A prize would be a very simple addition to make, should Coca-Cola ever decide to do so. You can choose a winner at random or reward the first correct answer. There’s room for customization, and you can tweak the contest each time you hold it so multiple people have a chance to win. More than 350 million photos are uploaded to Facebook each day. Media is taking over News Feeds and there’s no reason your brand shouldn’t capitalize on the trend. The photo features a woman, likely on vacation, with camera in hand experiencing something out of the ordinary. You couldn’t ask for a better photo for a caption contest. Tauck asked its followers to submit their captions in a comment, and the funniest and most original caption won a Canon digital camera. Once you have your Facebook contest idea set in motion, you’ll need to come up with a way to manage the influx of interactions your Page will receive. Categorizing and organizing your incoming messages can help make your team’s workflow more efficient. 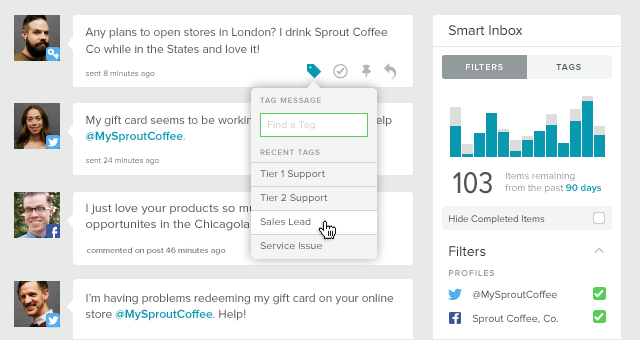 Message Tagging from Sprout, available in Professional and Advanced plans, helps you organize and track marketing campaigns by applying a custom tag to any messages you send or receive. So in the case of a Facebook contest, you can tag incoming messages with “contest entry” or “question about contest” to ensure the team member in charge doesn’t miss anything. Your work doesn’t stop when the contest ends. Now you have dozens, hundreds or maybe even thousands of engaged fans. This isn’t the time for a content break. Make sure you have a publishing strategy in place during, and especially after the contest in order to leverage the interest in and excitement around your brand. And one last thing: Don’t lose sight of your objectives. Contests are an easy way to pull in engagement and new fans, but that doesn’t mean they should replace your content strategy. Work them in occasionally and make sure the reason behind holding the contest aligns with your business goals.